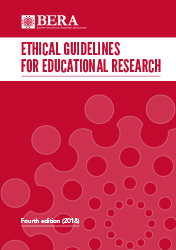 BERA’s ethics and guidance documents are used by educational researchers and those active in many other disciplines. Our publications include the following documents; click through for further information. BERA is seeking proposals from individual academics who wish to act as editor of a proposed series of three case studies on ethical decision-making in educational research (with the potential for that series to subsequently be expanded). Click here for more details.